You are currently browsing the tag archive for the ‘family stories’ tag. 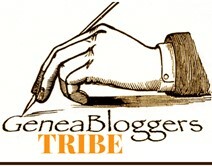 I was so happy to find my blog featured among the new genealogy blogs by GeneaBloggers.com on April 27. What an honor. I enjoy reading the blogs in this group because they are so varied, so colorful, so full of what makes history come alive: real people! I don’t need reality shows to catch my attention when there are so many spellbinding true stories that I can find in their family trees as well as my own. They set the bar high and I hope I can continue to offer observations and comments on genealogical research and family histories that will be of interest to my fellow genealogy bloggers. I’ve got a lot to learn and am thankful for this group and any advice I receive from its members. I’d like to know: have you found genealogy blogging groups or organizations that are encouraging to your efforts?